Villeroy & Boch Luxembourg European Arts and Crafts Pottery Vase. 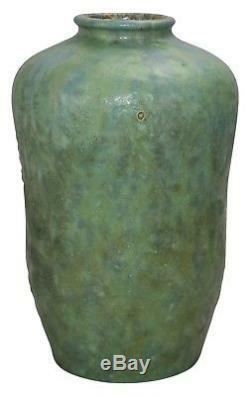 Rare and striking Villeroy & Boch Luxembourg European art pottery vase covered in great mottled and curdled matte green, blue and yellow. Great form, color and glaze. No chips, cracks, damage or repair of any kind. Some factory glaze pin holes and pops mentioned for accuracy sake. Bottom marked with logo, Luxembourg and 313/2. Vase is 10 1/4" tall and 6 1/2" wide. Be sure to shop our store for 100s of great buys on art pottery! Our art pottery selection includes many estate fresh examples in excellent condition and at great prices! New items added almost daily so check back often! Complete satisfaction is always guaranteed. The item "Villeroy & Boch Luxembourg European Arts and Crafts Pottery Vase" is in sale since Tuesday, September 18, 2018. 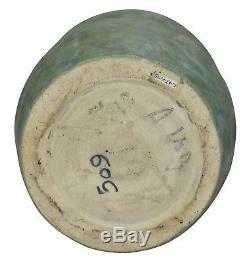 This item is in the category "Pottery & Glass\Pottery & China\Art Pottery\European Pottery\Other European Art Pottery". 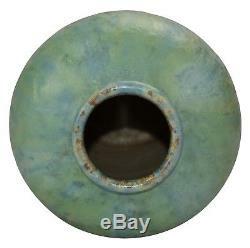 The seller is "justartpottery" and is located in East Peoria, Illinois. This item can be shipped to United States, Canada, United Kingdom, Denmark, Romania, Slovakia, Bulgaria, Czech republic, Finland, Hungary, Latvia, Lithuania, Malta, Estonia, Australia, Greece, Portugal, Cyprus, Slovenia, Japan, China, Sweden, South Korea, Indonesia, Taiwan, South africa, Thailand, Belgium, France, Hong Kong, Ireland, Netherlands, Poland, Spain, Italy, Germany, Austria, Israel, Mexico, New Zealand, Philippines, Singapore, Switzerland, Norway, Saudi arabia, Ukraine, United arab emirates, Qatar, Kuwait, Bahrain, Croatia, Malaysia, Brazil, Chile, Colombia, Costa rica, Panama, Trinidad and tobago, Guatemala, Honduras, Jamaica, Antigua and barbuda, Aruba, Belize, Dominica, Grenada, Saint kitts and nevis, Saint lucia, Montserrat, Turks and caicos islands, Barbados, Bangladesh, Bermuda, Brunei darussalam, Bolivia, Ecuador, Egypt, French guiana, Guernsey, Gibraltar, Guadeloupe, Iceland, Jersey, Jordan, Cambodia, Cayman islands, Liechtenstein, Sri lanka, Luxembourg, Monaco, Macao, Martinique, Maldives, Nicaragua, Oman, Peru, Pakistan, Paraguay, Reunion.